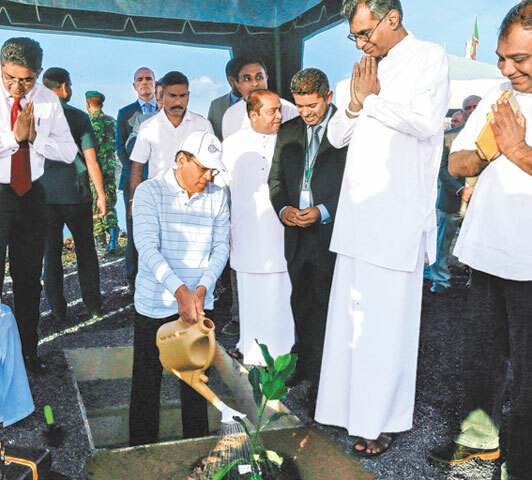 President Maithripala Sirisena watering a plant at the Karadiyana waste management project inauguration. President Maithripala Sirisena named the Karadiyana waste management project as the “Mihisaru Viyamana Resource Management Centre” and laid the foundation stone for the Karadiyana electricity generating project and landfill named the ‘Batahira Kasala Viduliyata’ project yesterday morning. The project is implemented by the Fairway West Management (Private) Ltd with the assistance of the Ministries of Megapolis and Western Development and Provincial Councils and Local Government bringing the vision of establishing large scale common waste management projects introduced by the Western Province Waste Management Authority under the ‘Punarudaya’ environment conservation national programme into fruition. A large quantity of waste would be collected daily at the Karadiyana Waste Management Yard, out of which 500 metric tons could be transformed into energy. Electricity generated by the project would be sufficient to feed 37,500 houses. It would also produce carbonic fertilizer in addition to electricity. The process would help reduce the amount of waste released to the environment by almost 90 percent and provide a sustainable solution to the environmental and social problems caused due to the dumping of waste. Ministers Patali Champika Ranawake and Ranjith Siyambalapitiya, Deputy Minister Lasantha Alagiyawanna and Western Province Chief Minister Isura Devapriya also participated.